Cats will do anything to find a sunny spot. 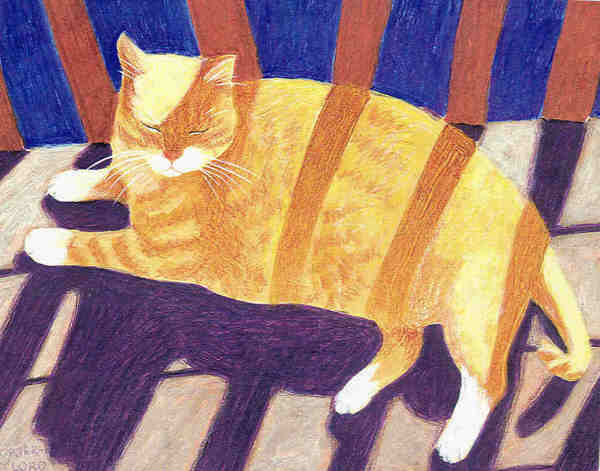 This is a painting of my old cat Biff who graced my life for nearly seventeen years. He had malnutrition and pneumonia and weighed 5 pounds when I adopted (stole) him from his neglectful owners. He showed his gratitude for life every single day. Meanwhile, I started my new job at the veterinary hospital on Tuesday. I have put in nearly 30 hours in 3 days which is why I've been so scarce, yet again. It will take some time to get acclimated to these hours, but so far it's going well. Everyone is nice and helpful, but best of all I get to hold puppies again and greet so many new fur friends! Oh, and getting a paycheck again? Priceless! I hope to visit you all soon. It looks like I've missed a million posts! Oh how I love this painting - the colors and patterns are amazing! It also reminds me of my big orange cat, Harvey, who was "adopted" in much the same manner as your dear Biff. Oh yay on the new job and its where you want to be too. I have missed you...just so you know. Annie is doing great now. She limps sometimes but walks normal a more often then limping. Love the drawing. Hellooooo..it's your Sisters, Marianne and Robin. We're here in my apartment, getting ready to take the Ferry to Sausalito for lunch. We MISS YOU....but we are so proud of you for getting through your first three days of work with flying colours! Marianne knew about Biff - just from your first words of *Stripes and Sunshine*...but this was my first time seeing her....she was gorgeous! What a great painting!!! I am happy you are enjoying your job!!! Bliss looks marvelous in the previous post. love the stripes, and the sunny drawing. it's such a cozy thing to look at on this rainy grey day. i hope your not working too hard, and the days shorten a little for you. that's a lot of hours. So happy for you LO, and you were a GOOD SOUL to steal the poor cat from the neglectful owners! Hope things continue good at work; I am sure that all the animals love you! Nice subject matter and colours! Beautiful story or love and beautiful job news. So good to see you around again. I love Biff - what a gorgeous kitty he was. And congrats on the new job (getting to hold puppies? nice. :) Happy weekend - xox! look at those shadow stripes! that is my favorite: how the shadow stripes and biff's stripes create a whole. haha, i can just see you rescuing that kitten, and holding those puppies. love appears in so many ways. virginia satir's research says we humans need eight hugs a day to be grounded and happy. and animals count. So glad you have a new job to enjoy! Henry spent a lot of time in my lap today while I knit or tried to while he tried to sit on my arms! But I love him and the sweater will get done eventually! Those are some long days Lolo. So glad you are doing what you want to be doing. If not it would be intolerable. Best of luck. Love seeing some of your art again. That is truly the look of contentment from napping in the sun! Good luck with your new job. Well, you are not the only one, with work and painting and a new fur baby to train blogging gets pushed to the back. This is a wonderful cat :-). Congrats on the new job, doing what you love, but I must have missed something I thought you were working at the store? You're a lucky girl! Have fun at the new job. I can't seem to keep up with your life anymore, so many changes. But at last you are back where you belong- with these animals who adore you. Best of luck and am so happy for you!!! I'd like the puppy holding but I think I'd die of an allergy attack. This is really cut e:D i love the shadows. Working in a vet hospital is awesome - one of my past favorite jobs (as long as you don't have to collect money from the parents of the pets). What is your job? Tell us all about it!!! Such a beautiful illustration. Glad to hear about your new job.